ENSO has had an unusual display this time around. 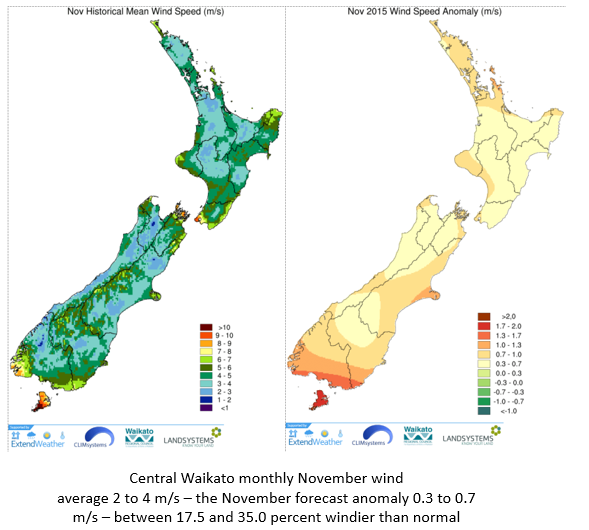 December was a dry month across most of the country which reinforced already dry conditions in part of the South Island while the drier areas of the North Island that had enjoyed reasonable rains in October and November began to show some signs of stress. Then 2016 began with a splash. The rains have come to long dry places in the South Island and some important dairy areas of the North Island have experienced regular moderate rains. One of the main comments we have heard this summer is 'what about those winds'? It seems to have been windy and this was reflected in the wind forecasts generated for the month of November and December (maps of wind forecasts). Wind is important. When sunny and dry weather is accompanied by faster than normal average wind speeds drying out of soils is accentuated. 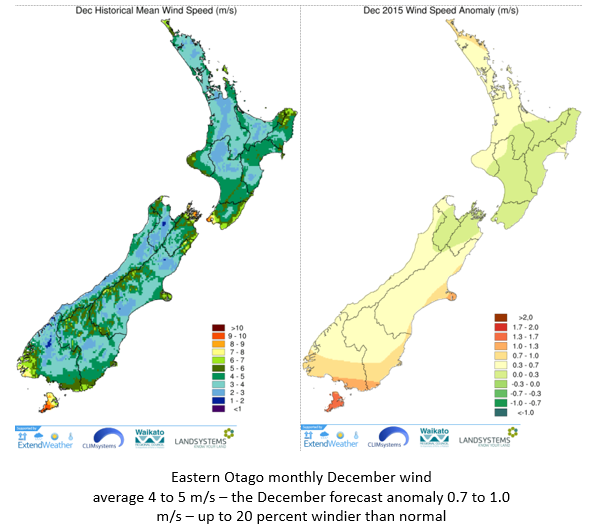 With a trial subscription to Extendweather you can explore the wind forecasts for New Zealand that are updated every ten days. Hot wind accelerates the drying of the plants by replacing humid air with dry air in the inter cellular spaces. High wind speeds can influence the rate of photosynthesis. Strong wind damages can damage young shoots. Crops and trees with shallow roots can be uprooted. Cold wind causes chilling injuries. Cause soil erosion and increase soil evapotranspiration. What might the second half of summer be like? Temperature outlooks have been very good over the months of November and December and January looks on target. February may finally show us some of the summer temperatures that we have been holding out for. March also looks likely to be slightly warmer than normal and then onward from there the temperature forecasts looks near normal until July when things turn cooler than normal. Remember the 30 year average monthly temperatures only repeats itself year-on-year 15 to 20 percent of the time or about 1 year in 7. This is why seasonal forecasting can be important to you and your activities. You need to know what the forecast is for this year not the average over seven years. Click on the link to access the free forecasts and sign-up FOR FREE to a trial to access more months, the proprietary image viewer software package and, additional variables such as wind.